Chiltepin peppers on cowboy ladle; photo by Steven Leggett on Flickr (noncommercial use permittted with attribution / share alike). The name "chiltepin" is believed to be Aztec in origin. A tiny round berry slightly larger than a peppercorn. 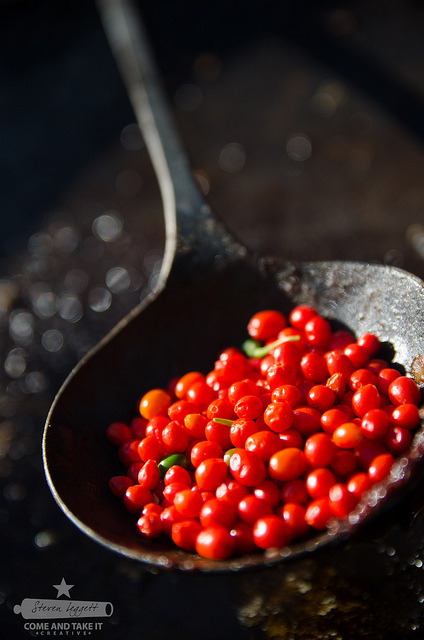 Experts believe the Chiltepin is the original wild chile - the plant from which all others have evolved! The bush grows an average of 4 feet tall, but there are reports of plants growing 10 feet and living 25-30 years. Heat level: 8 on a scale of 10 - very hot. 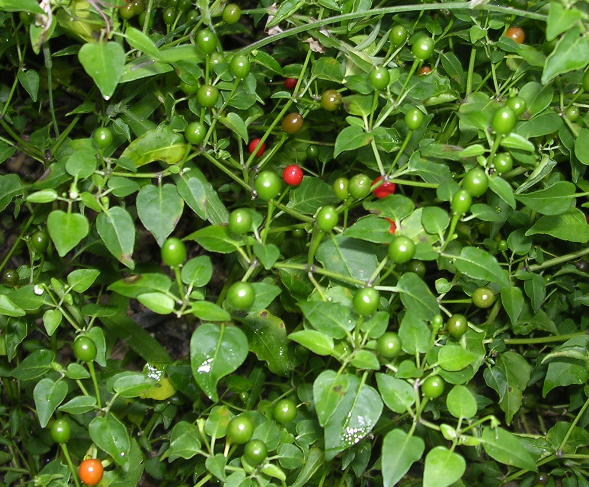 Chiltepin pepper plant; photo by trekr on Flickr (noncommercial use permitted with attribution / no derivative works).